The marketing messages remind motorists that the four-lane tunnel, expected to open about Feb. 4, goes completely under downtown, from the stadiums to the Space Needle. 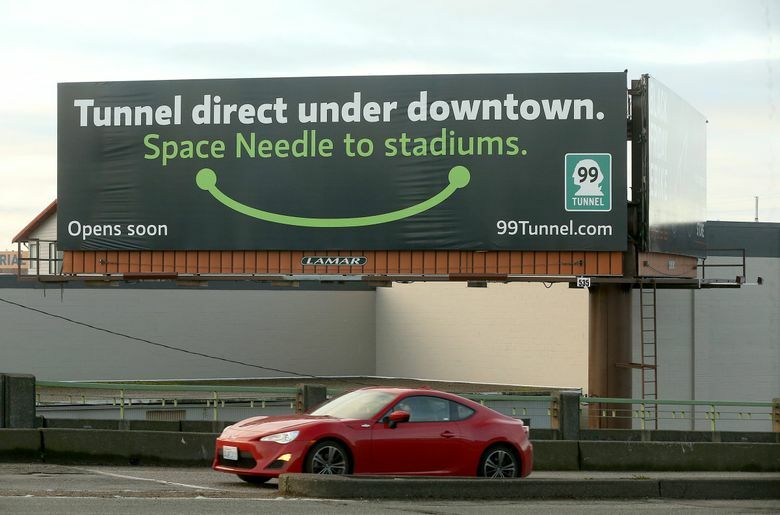 If you’re desperate for a smile while stuck in Seattle-area traffic, just look toward the billboards where Washington state has launched a $4.4 million marketing campaign that promotes the new Highway 99 tunnel as resembling a happy face. The messages remind motorists this four-lane tunnel goes completely under downtown, from the stadiums to the Space Needle. Television ads depict people performing a swooping “under” gesture — for instance, while ordering a chicken sandwich with meat beneath the lettuce. Viewers are encouraged to check www.99tunnel.com. The shape resembles the trademark smile of Amazon, which dominates several blocks near the tunnel’s north end. “We anticipated that reference. We needed a visual cue that was clear and concise,” said Emily Glad, spokeswoman for the Washington State Department of Transportation (WSDOT) toll division, who points to McDonald’s, IHOP, Colgate and Kraft macaroni ads featuring smile shapes. Spending millions of dollars on marketing may seem absurd to people who followed 18 years of debate, engineering and construction, culminating this month with constant stories by this paper, the four major television newscasts, public-owned media, and every local radio news team. Signs over the road lanes will further inform Highway 99 drivers. On the other hand, a WSDOT online survey in 2017 found only 30 percent of respondents knew the tunnel will have different exits and entrances than the old Alaskan Way Viaduct, so drivers heading downtown need to backtrack on other streets from the portals at either end of the tunnel, Glad said. In the marketing pitch, a tunnel without the viaduct’s mid-downtown and Belltown exits is called Tunnel Direct. Soon the campaign will enter a second phase with billboards that say “Tunnel for Free.” WSDOT wants drivers to try the new highway before tolls begin this summer, so they understand its benefits and can decide whether to eventually pay, Glad said. Toll rates will vary by hour-of-day in a range between $1 on weekends to $2.25 in weekday afternoon peaks. Surveys showed two-thirds of respondents were unaware that they need a state-issued Good to Go pass, mounted on the windshield, to avoid an extra $2 handling charge when tolls are billed by mail. People who have passes are more likely to choose a tunnel trip instead of diverting to city streets. The $4.4 million cost is funded through the $3.3 billion Highway 99 budget, paid predominantly by gasoline tax revenue. It exceeds the $858,000 Sound Transit spent for promotional websites and festivities when University Link light-rail extension opened in 2016, plus the $1.8 million budgeted that year on transit ad buys. Mariya Frost, transportation analyst for the conservative Washington Policy Center, said the ads convey some useful information, but calls a $4.4 million outlay frivolous. “For the most part, I think the advertising serves mostly as a way for DOT to pat themselves on the back politically, to say, ‘Hey, the tunnel is finished,’ ” she said. At the moment people set out to travel, they’ll be checking Google Maps or Waze rather than a tunnel homepage, she predicted. The pro-transit volunteer group Seattle Subway said that in light of wall-to-wall tunnel news coverage, the $4.4 million marketing blitz deserves a “front-page takedown” like Sound Transit faced for subsidizing the station-opening party. “Projects related to transit, biking, walking are put under a microscope, while projects related to carbon emissions get a free pass in the public eye, too often,” Seattle Subway political director Ken Anderson said. Of the tunnel-ad expenses, some $800,000 went toward ad buys aimed at the planned Feb. 4 tunnel opening, while $2 million will buy ads in the next phase. About $1.6 million goes to creative consultants Sherry Matthews Group of Austin, Texas. Glad said that firm won a continuing statewide contract in 2015, when WSDOT spent $3 million publicizing the I-405 express toll lanes and Good-to-Go passes. The I-405 outreach is generally considered a toll-industry success, in which more than 80 percent of toll-lane trips were made with a pass or state toll account that fall.